and black flies) dominate at the coldest temperatures, and the nymphs of a number of mayflies (Baetidae) and stoneflies (Nemouridae, Chloro-perlidae) are added to the assemblage as one proceeds downstream and waters warm above 4°C. At still warmer temperatures, caddisfly larvae and additional families of aquatic insects appear. Milner et al. 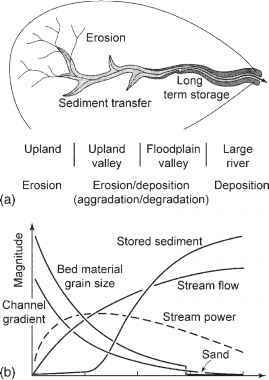 (2001) used maximum summer water temperatures and channel stability to construct predictive models of macroinverte-brate diversity across seven glacial rivers in Europe. A combination of zonation and downstream addition of fish species was evident along an elevational gradient from 2,200 to 1,200 m in a Rocky Mountain stream (Rahel and Hubert 1991). Salmonids dominated headwater reaches but were replaced by a warmwater minnow-sucker (Cyprinidae-Catostomidae) assemblage below 2,000 m. Such longitudinal replacements may involve a combination of competitive effects and the influence of temperature on feeding and physiological performance. The longitudinal replacement of trout at high elevations in Rocky Mountain streams by the creek chub Semotilus atromaculatus at low elevations was attributed to both appetite loss and behavioral interactions and so was not solely a function of physiological performance (Taniguchi et al. 1998).